Paleo Diet Recipes Archives - PaleoMunch! If you’ve got a bit of a sweet tooth then you might have had some difficulty in finding delicious, paleo (as much as possible) and easy to make treats. Many paleo focused blogs focus on trying to replace ingredients in recipes, especially desserts or treats, with ingredients that are paleo. Sometimes, this doesn’t work too well because there are some ingredients which actually don’t work in paleo versions of these recipes. I know, that’s pretty sad. Well, these paleo chocolate bon-bons are a rare exception to the notion that certain recipes can’t be “converted” to paleo. These are mostly (like 95%) paleo, and are absolutely mouthwatering. Combine all the dry ingredients in a mixing bowl. Make sure everything is well mixed together. The mixture should be relatively dry because the balls should hold themselves together, but not droop down with time. Gently melt the butter, honey and vanilla essence in a pot on the stove. Pour the melted mixture into the dry ingredients and mix completely. Lay out a piece of baking paper and carefully use two teaspoons to portion out the mixture, then use your hands to roll it into balls. You can choose how large you’d like the balls (bon bons?) to be, but a smaller size results in a more delicate, mouth sized treat. Optional: If you like, melt a little dark chocolate and put a blob of it under each bon bon. This just adds an additional dimension to these awesome treats! There you have it. One of the most delicious, easy to make, ingredient friendly paleo treats you can make. The texture of the almond flour and chia seeds is quite something to behold, and these can even be eaten for breakfast (in moderation). Be warned though; they are insanely moreish. You just can’t stop eating the things, so make a lot of them! How do you get the whole family to participate in the magic that is paleo? If you’ve been a follower of the paleo diet or in fact have tried any other way of eating for any length of time, you have more than likely come across some sort of friction between your family and yourself when it comes to dietary choices. Most of the time this friction will occur where your choices in food is out of the ordinary. No bread, pasta or sugar in your food will probably get some sort of response from most people who eat according to a western style diet. Some people will worry about you not getting enough carbohydrates, or that your fat intake is going to destroy your waistline, or that your cholesterol is going to turn your heart nuclear. None of these worries are founded in proper wisdom, and whether you like it or not it will become your responsibility to educate those you care about on the troubles of eating high carbohydrate diets based heavily in grains. Don’t worry too much though, you don’t have to take the responsibility as seriously as you may imagine. It is more a guiding hand sort of responsibility than ruling with an iron fist. At the end of the day, it is each person’s responsibility to make the right decisions when it comes to what you eat, how you exercise and how you view and embrace health. Why not take the kids to the store and make a game of the actual food buying process? This time is a good place to teach your children, no matter the age, what healthy food looks, smells and feels like. Let them touch the fruits and vegetables on display and decide which ones are their favourites. Avoid the aisles that are psychologically designed to feed into what a child is exposed to. Giant, happy, friendly cartoon characters punting sugary, basically poisonous breakfast cereals which are void of any nutritional value. These foods are designed to get a child to eat them, get addicted to them, and ultimately contribute to that child’s understanding of what makes up basic nutrition. This is wrong to me. I think that if there were no breakfast cereals available people would instantly be healthier. A simple way of getting the little people to buy into the food buying game is to allow them some freedom to learn what they like. Allow them to choose one food that will go towards making dinner, for example. Try and keep to the healthy areas, and encourage them to make better decisions. Allow them to choose whatever they like, but if they make an obviously bad choice, say, bread rolls smothered in cheese, guide their focus to something more nutritious. Sweet potatoes perhaps. This step is not only limited to the little members of your family, but the old too. Farmers markets are much more vibrant and colourful than a supermarket, and give a more “real” representation of what good food actually is. Wether its hand selecting vegetables or asking for specific cuts of meat, the experience is engaging and attractive. Let them go out and find what they think would work well together and make dinner with what they bring back. It is a fun, simple and very rewarding experience not to mention it totally changes the shopping experience for the little guys. Remember that all of this is about having fun, spending time together and bonding. The beauty here is that you are instilling in your kids vital good nutrition making skills from an early age. It’s all about future proofing their health. Why not start on day one by associating pleasure with healthy foods. Let everyone in the family contribute to dinner in simple ways. Don’t assign overly complicated tasks to people when they obviously aren’t interested in doing them. Fortunately, being paleo means not many peeling of vegetable jobs will be passed around like a hot potato. Keep the mood light and make it a family event rather than a chore. This level of participation may only work for preparation, as certain dishes need only require one chef. Let everyone eat with their hands. This obviously works best if the food is actually hand friendly. Ribs, broccoli and chicken wings are great primal eating foods that carry with them a simple primal eating experience. Broccoli snaps in your mouth and the eating of ribs requires the use of some of your oldest teeth, the canines. If kids are involved who aren’t ready for this sort of eating, pre-prepare the food for their consumption and sit with them when you both eat the same food with your hands. There is no reason why the little ones can’t eat what the big ones are eating. To me this is hugely important. I’d love to experiment with removing a level of “difference” between how kids and adults eat and see what sort of dynamic is would create between a family unit. Foraging, preparing and eating foods in as real a way as possible will help ingrain some really great food principles in young ones, but I’ve found that even older people are ready to reexplore the food and nutrition parts of their lives. We are all human, and we all want to experience new and old things everyday. Preparing food in the ways mentioned above is also a great way to help people understand just what goes into a tasty, healthy dish. What does fat do to a meal? How does it change the flavour of a dish? What does it do to the texture of a meal? This sort of learning experience happens naturally when the meals are simple and easy to see. What I mean is that with many western diet dishes such as pasta based meals the foods incorporated all sort of blend into one “food”. With a primal approach to the selection, preparation and cooking of foods, most foods retain their original form. This makes it clear that each food has its place and can open the door for explaining the nutritional differences between meat and vegetables for example. 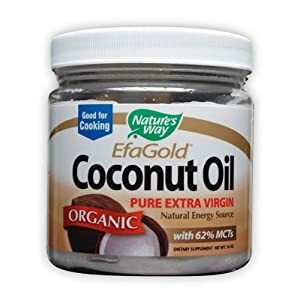 Coconut Oil: Is It The Best High-Temperature cooking Oil? Cooking according to paleo guidelines may seem to be difficult because of the diet’s specific cooking fat requirements. The most common of these is without a doubt coconut oil. Coconut oil may or may not be difficult to find in your local food stores, if it’s easy to find, good for you! For the rest of us, we’ll have to search alternate places for our coconut requirements! Coconut oil is rich in three acids effective in treating a multitude of conditions which are either “naturally” developed, or externally developed in the body. Coconut oil is regarded unofficially as being a mircale food which can treat everything from skin conditions such as acne to lowering the symptoms of HIV. The HIV bit I’m not so sure about, however I am aware of the benefits of coconut oil in cooking. Coconut oil is largely non-genetically modified, and as such is much more balanced in terms of omega 3 and 6 fatty acids. Also, because vegetable based oils actually oxidise when exposed to heat, they are actually pretty bad for your body. Vegetable based oils rich in omega 6 fatty acids, and because of their large rate of consumption in modern culture, contribute to omega 3 and 6 imbalances. 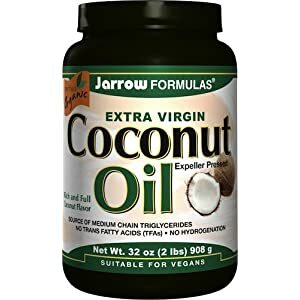 Enter coconut oil, none of the degenerative properties of vegetable oils and olive oil, all while maintaining an amazing level of stability with heat. Coconut oil is simple to digest, rich in omegas and helps in lowering cholesterol. Coconut oil beats olive oil initially in that it has a better balance of saturated fats. Also, because of the trans fat free cholesterol found in coconut oil, the body promotes a healthier balance of good and bad cholesterol. Coconut oil promotes better cholesterol metabolism so the “bad” cholesterol is dealt with more effectively. 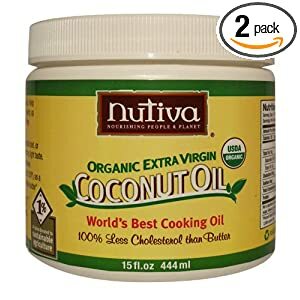 Due to the fact that olive oil has a lower smokeing temperature than coconut oil, coconut oil is the logical choice when being used for heat based cooking. Olive oil on the other hand should be used for cold meals such as salads etc. Another reason vegetable oils aren’t that great for you is that when heated and broken down somewhat, they can promote blood platelet stickiness. This is bad as your platelets are required for the repair of cuts and bruises, being involved with the reperation of tissue as well as being responsible for the stopping of bleeding. Olive oil and coconut oil share a similar amount of calories per 100ml; 890 and 892 calories respectively. When choosing oils one should always ensure that virgin or extra virgin varients are used. This is related to the process of preperation of the oil and generally signifies a level of the highest quality obtainable. Coconut oil is also great for desert making. I know of a great coconut ice recipe that is as close to paleo as you can get! Author AndrewPosted on August 6 February 19 Categories Paleo Diet Recipes, The Paleo DietTags baking with coconut oil, coconut oil vs olive oil, cooking with coconut oil, extra virgin coconut oil, health benefits of coconut oil, how to eat coconut oil, organic coconut oil, where to buy coconut oilLeave a comment on Coconut Oil: Is It The Best High-Temperature cooking Oil? Paleo Ice Cream: Does It Really Work? Does Paleo Ice Cream Even Exist? Sure it does, and it’s delicious. The biggest challenge when making paleo ice cream is probably the fact that no milk and sugar are allowed. What? Ice cream, with no cream? The consistency of ice cream is achieved by using a combination of almonds and coconut. Sweetness is derived from honey and vanilla beans. The nicest thing about making paleo coconut ice cream is that it doesn’t require that much work or ingredients. Find the paleo ice cream recipe below and get your snowman on! Makes around 1 litre of ice cream. Shredded coconut: 2 cups, make sure it is unsweetened! Vanilla bean: 1 bean should be good! Soak the almonds until they are soft. This can take all night so prepare in advance. Make sure they are rinsed properly before the soaking. Blend the soaked almonds in a food processor with water. Aim for quite a smooth consistency. Use a super-fine strainer to remove the almond pulp from the blended mixture. Boil your kettle and add around two cups to the coconut. Blend the mixture for around 5 minutes on high. Everything must be super smooth. Again, strain the coconut pulp to remove any solid bits. Have a pot ready on the stove heated to a medium heat, add the almond and cocount mixture and stir. Cut open the vanilla bean and add it to the pot. Seperate the egg yolks and add them to the mixture. Stir the mixture frequently and control the heat so that its just below simmering. This is very important! Make sure the mixture never simmers. This will curdle some of the ingredients. Keep mixing until a desirable consistency is reached. A good way to judge is to check if the custard sticks to the back of a wooden spoon, and has a consistency like that of cream. Remove the mixture from the heat and let it cool off. It should be allowed to cool to room temperature. Remove the vanilla bean and remove the seeds from the pod, add the seeds back to the mixture. Add the honey and stir it in completely. Put the mixture in the fridge, and once its cooled down enough, you can freeze it. See? Not really that difficult. So get to it, and let us know how it goes? Author AndrewPosted on July 20 February 19 Categories Paleo Diet RecipesTags paleo coconut ice cream, paleo ice cream, paleo ice cream recipeLeave a comment on Paleo Ice Cream: Does It Really Work? This weekend I tried some stuffed peppers a friend had made, and it got me thinking about how I could make some paleo okay stuffed peppers of my own. These would obviously have to not include any rice, grains or dairy products. Most of the recipes I have discovered online aren’t very paleo, so we’re going to have to try some reverse engineering to get things right. When I think of stuffed peppers I think of Mexican food, and when I think of Mexican food I think of pork. This gave me an idea to make some pork filled paleo stuffed peppers. If you’ve read my blog at all you’ll know that I love pork. Check this article out, too! Sundried tomatoe and spinach flavors are amazing, and can possibly only be enhanced by the addition of feta cheese. Seeing as though feta cheese, or really any cheese for that matter isn’t paleo compliant, we have to exclude them from the recipe. Dairy is bad for the body in any case and is not on the paleo diet foods list, so it’s really not a biggy removing cheese from our paleo stuffed peppers recipes. Lean pork mince, around 500 grams. Peppers: You can go for a multitude of colours to make them look cool. A variation in size is also good, especially when serving children. Not: The flavour profile of sun-driedtomato may not be to every child’s liking. Spinach: Quite a bit, because we want to pack the pepper pretty well. Sun-dried tomatoes: The more the better. Cut off the top of the peppers; the part where the stem comes out is good. Clean and remove all the innards of the pepper and remove them. For the pork: I like to mix the mince in quite a bit of olive oil and salt and pepper. You can try and use something like wok sauce or soy sauce to give the pork a robust flavour. Salt is magic with pork. Break up the spinach with your hands, if you have baby spinach (my favourite) break it up less vigorously. Mix the broken up spinach with the sun-driedtomatoes and drizzle with some more olive oil. Pack the peppers with the spinach and tomatoe mixture. You can pack them quite tight. After you’ve packed the peppers, put the cap with the stem back on top. Place the peppers on a baking tray. Cook for around 20 minutes. While I’m not sure that cavemen would have made something quite this delicious, they would certainly understand it’s ingredients. That’s an interesting way of looking at the paleo diet hey?